Narrative: This flute was passed down through the descendants of William Hebb. William Andrew Hebb was born 18 June 1867 in Hebbville, N.S., the son of Emmanuel and Catherine Elizabeth Hebb. William Hebb married Clara B. Mullock on 15 January 1907. Had 3 daughters and 1 son. Worked as a mixed farmer in Hebbville. William A. Hebb was president of the Lunenburg County Exhibition Commission for 25 years. Served as agent for Colonial Fertilizer from Windsor. Had a huge apple orchard. In politics, he was a supporter of the Conservative party. William A. Hebb died 27 July 1950 and is buried in Brookside Cemetery, Bridgewater. Clara Hebb died 6 February 1960. 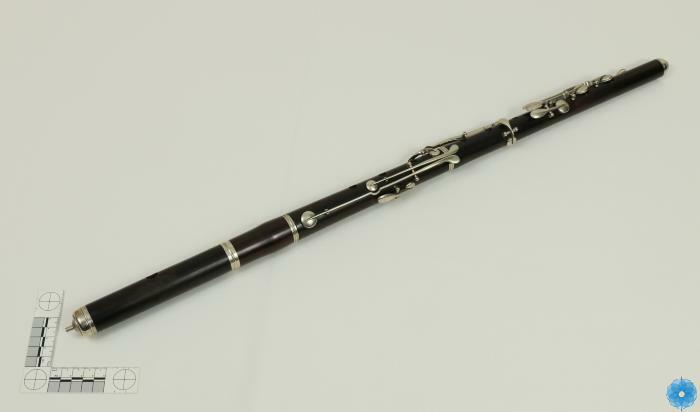 Description: Black antique wooden flute with silver coloured metal valve stops and end pieces. There are four sections that come apart that would fit into a specially designed carry case. Small thin piece of metal with a 2 cm round brass disk on one end. Used by William A. Hebb of Bridgewater. History of Use: Used to play music by William A. Hebb for many years when he played in the Bridgewater Band and at other musical events.